PostgreSQL will shortly be released and it is therefore time to take a look at one of the most important new features provided by PostgreSQL 11: The ability to create indexes in parallel. 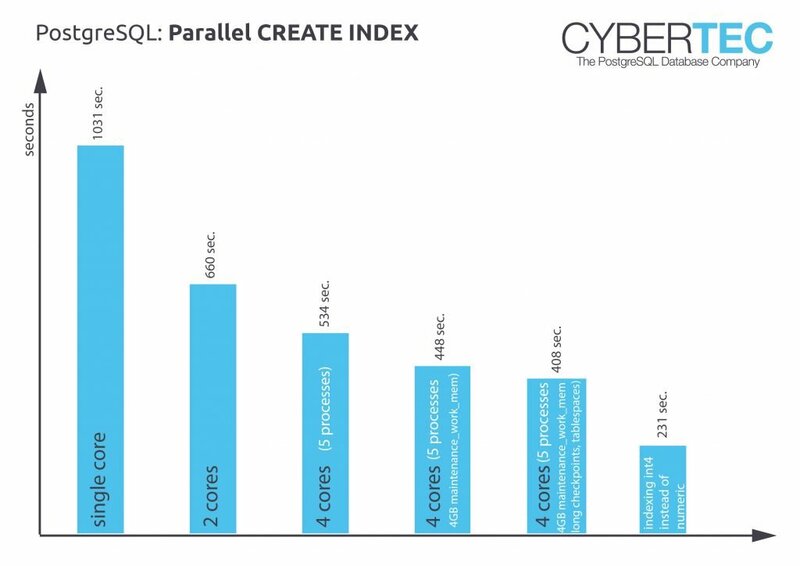 For many years various commercial database vendors have already offered this feature and we are glad that PostgreSQL has become part of this elite club, which offers multi-core index creation, which will dramatically improve the usability of large database deployments in the future. The reason why I went for numeric is that numeric causes the most overhead of all number data types. Creating a numeric index is a lot more costly than indexing, say, int4 or int8. The goal is to see, how much CPU time we can save by building a large index on a fairly expensive field. The consequence is that indexing will take forever. When running the CREATE INDEX statement we will see a lot of I/O and a lot of CPU. To make things worse I left all memory parameters at their default value, which means that the index creation has to work with only 4 MB of memory, which is nothing given the size of the table. 17 minutes, not too bad. Remember, we are talking about 500 million of really nasty lines of data. Wow, we are down to 11 minutes. Of course the operation is not completely linear because we have to keep in mind that those partial results have to be merged together and all that. But, there is a catch: If set max_parallel_maintenance_workers to 2 and what we saw is 2 cores, right? What if we set the value to 4? In my case 4 is the number of physical cores in the machine so it makes no sense to use any higher values. What you will see is that PostgreSQL still uses only two cores. In this case both, max_parallel_workers and the table parameter are set to 4. What we will see now is that PostgreSQL will utilize 5 processes. Why does that happen? What you will see is one main process and 4 processes helping with index creation. That might not be totally obvious but it makes sense when you think about it. Everybody is doing the same thing pretty much at the same time so we will see wild swings in our I/O curve, which naturally makes the entire thing a bit slower and not linear. Still, we managed to speed up our index creation from 17 minutes to close to 9 minutes by simply adding more cores to the system. In my case I decided to pump the value to 4 GB. My server has 32 GB of memory and we have to keep in mind that we are not the only ones, which might create an index so 4 GB x 5 cores might already be a really aggressive value in a real world scenario. What we will see while creating the index is a lot more parallelism going on in the first phase of the index creation, which is exactly what we are supposed to see and what we expected. You can also see quite clearly that towards the end CPU usage is pretty low and PostgreSQL is waiting on the disk to do its job. The entire system has been set up with default values so writes have not been optimized yet and are therefore going to be an issue. Let us create a new index using those larger checkpoint distances. When looking at the process table while building the index you can notice that PostgreSQL spent quite a lot of time on writing the WAL to disk. As long as we stick to a single SSD there is not much more we can do about it. However, what will happen if we play our next trump card? Additional hardware. What if we created all our temporary data on one disk, send the WAL to the main disk and create the index on a third SSD? This way we could split the amount of I/O needed quite nicely and see what happens. As already stated adding more hardware by using tablespaces might be a good idea. I am well aware that this might not be possible in a modern cloud environment. However, on my test server I still got the luxury items: A couple of real physical SSD drives. What we see here during the index creation is that our throughput peaks at higher values than before because more than one SSD can work at the same time. Instead of 500 MB / sec peak our throughput goes up to as much as 900 MB / sec at times. The overall speed has improved as well. We are already below 7 minutes, which is really nice. If you add more hardware to the box it might be worth considering to create one filesystem using all disks at once. I did not have time to test this options but I assume that it might similar and maybe even better results then what I was able to come up with in this first test. TIP: Don’t underestimate the importance of the data type in use. If we did the same test using normal integer values, we could create the index in 3 min 51 seconds. In other words: The data type is of significant importance. In this post you have seen that creating indexes can be improved. However, keep in mind that new indexes are not always beneficial. Pointless indexes can even slow down things. To figure out, which indexes might not be needed, consider reading a post written by Laurenz Albe, who explains, how to tackle this kind of problem.